This is one of our El Cardon air conditioned apartments to rent. It has one bedroom and can sleep up to 4 people on a double bed and double sofa bed. 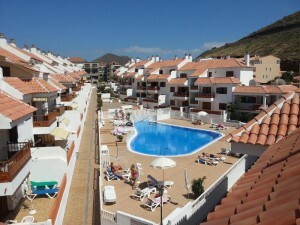 We have stayed at the El Cardon complex in Los Cristianos for the last 4 years. We choose to return because the complex is in a fantastic location only a few minutes walk to the Las Vistas beach and if we are feeling lazy we can just use the pool which is heated. We loved the apartment we booked this time. It was a one bedroom apartment which was clean when we arrived and nicely furnished. The kitchen was well equipped which was great as we did a lot of eating in. We enjoyed walking along the seafront promenade in both directions. We went to Harrys Bar one night which is in the Safari Shopping Centre. Talking of which we had one cloudy day, which I spent in Zara, so no complaints there. We enjoyed our visit to El Cardon last week. We are a couple in our 60s and we booked a one bedroom apartment. It was a south facing apartment which therefore had lots of sun on the terrace. There was also a sun lounger for relaxing. The apartment had a double bed, which was just what we were looking for. It was very comfortable as well. We were delighted to discover that the apartment had wifi internet access inside the apartment. This really should be standard in this day and age. It was very handy to be able to look up restaurants before walking out in the evening. The apartment also had a washing machine, which meant that we didn’t have to pack so much.